Michael Constantino, Regional Sales Manager for Festool, demonstrated the Festool system using Festool circular saw, joiner, and sander. Michael showed club members how all these tools integrate with the portable tables and conveniently packable and easily movable tool boxes and, of course, the dust collector. Numerous tips were provided by Michael who also answered member questions. Using a CNC machine on ½ inch Birch plywood, Terry Parrish crafted a rocking chair that can be disassembled and stored easily. The Texas wall art came from pieces of plywood used “differently”. 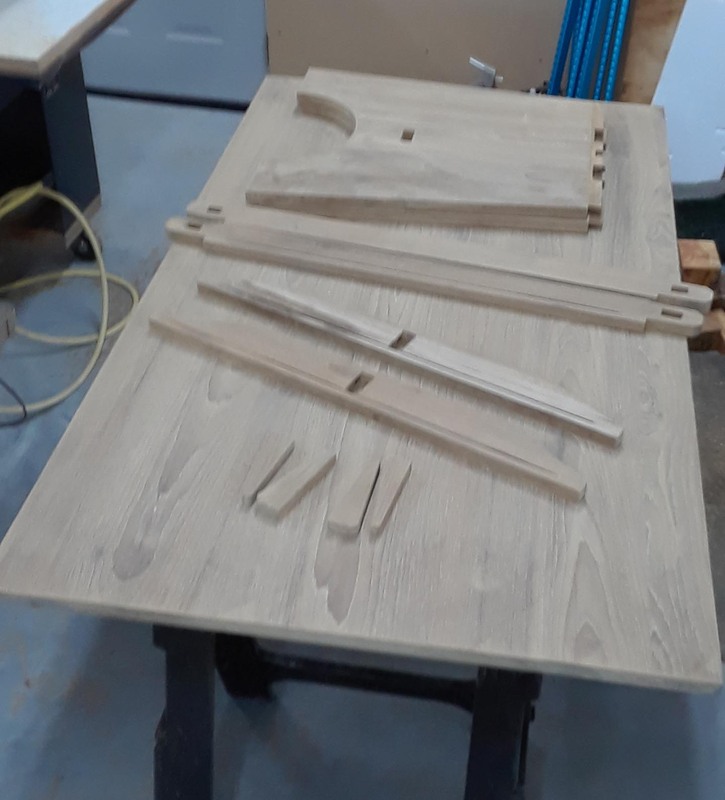 A combo jointer-planer was delivered to Tom Paulley on a pallet of the nicest wood that he has seen – guessing maybe Austrian pine. From a Popular Woodworking magazine design Tom crafted a foldable shop stool finished with two coats of Danish oil. 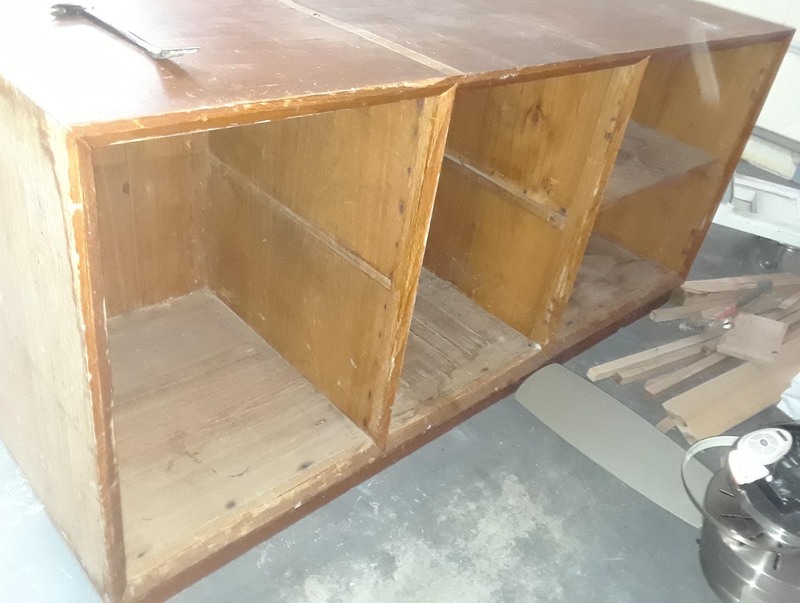 A client of David Janowitz brought back a solid teak entertainment center from Thailand which David converted into a trestle table. 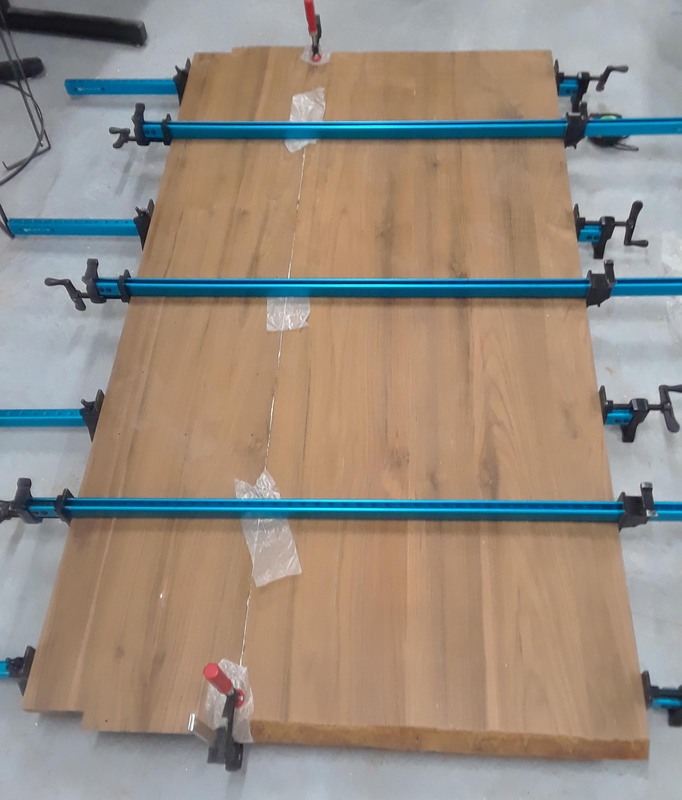 The stretcher is secured by wedged tenons.David finished with water borne urethane. View more photos. From a Charles Hand pattern Rick Spacek crafted a cabin out of Wink1 wood topped with acrylic paint and a clear coat. From a picture came the peacock which included a little bit of carving then finished with clear coat for shine. 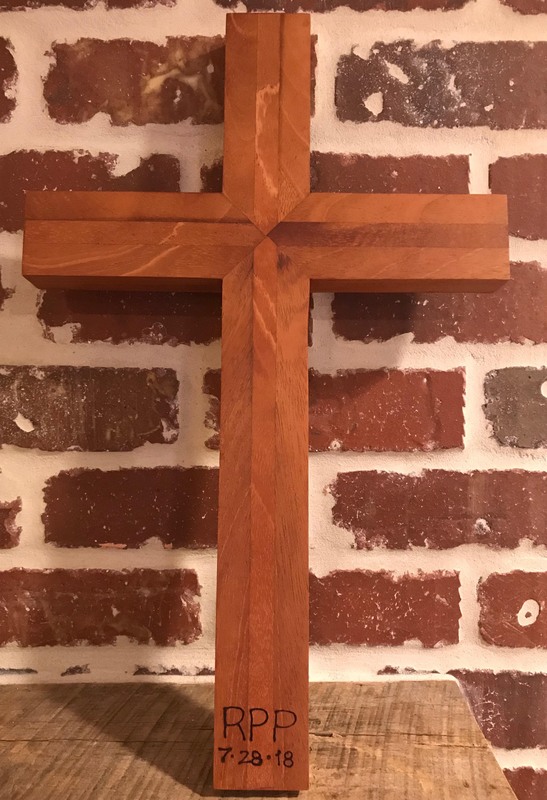 Confessing that not everything he does is on a scroll saw, Norm Nichols crafted this 20 inch cross from black walnut, poplar and purple heart of ¼ inch strips cut to various widths ½ to 1 inch. Norm finished with clear stain and polyurethane spray. From three eight foot one by fours, Jack Baile made two Kernov style sawhorses of pine. 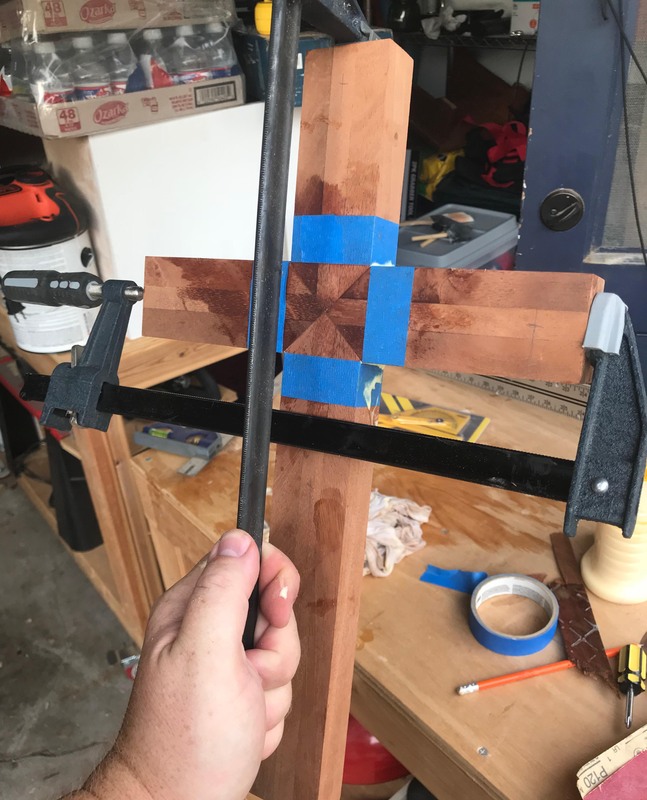 The top cross pieces are not glued but doweled to facilitate replacing for repair. Download plans for Jack's saw horses (PDF file). Thanks, Jack. Bob Wink hits the table with his folk art stage with Little Red Riding Hood and the proverbial Wolf. Bob’s wife always wanted a Scotty Dog so Bob crafted one that brings its own luggage – plus no mess to clean up. The armadillo was crafted for a friend and Bob thanked Norm Nichols for pointing out that armadillos have nine ribs and not seven. Inspired by Steve Good patterns, Dave VanDewerker crafted several vases from cherry, maple, some scrap and some plywood then finished with spray lacquer. Are wood carved flowers next?. George Graves showed members a small collection of little boxes all cut on a scroll saw. Pete Seeger can't sing his "Little Boxes" song here. Chris Farquhar’s first attempt at intarsia turned out very well – an intarsia beagle of various woods finished with satin polyurethane. He is looking forward to his next intarsia project. No, it didn’t start out as Snoopy. For the Toy of the Month2, Chris Schwartz made a model of a light plane, a design inspired by fellow WWCH member Bill Hoffmeister. Lisa Sessions showed members her bath caddy of walnut and maple finished with coats of Waterlox (hmmm...an appropriate finish?). Lisa isn’t likely to use it in the shower. 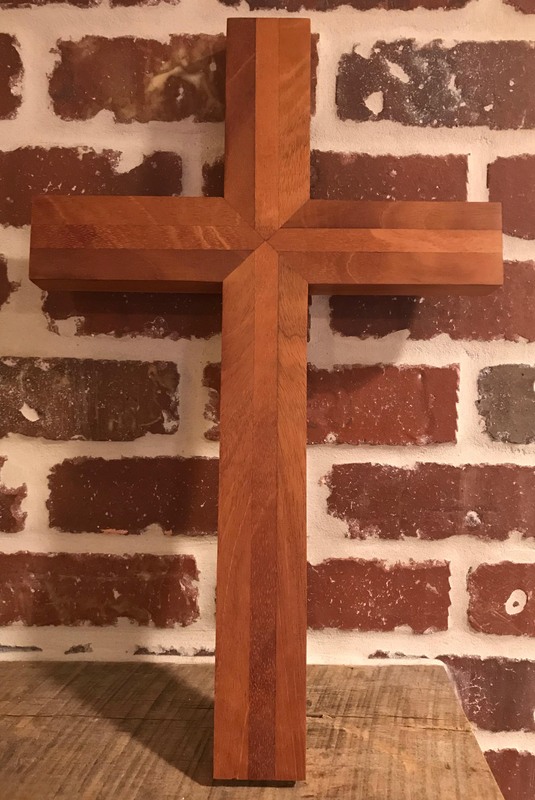 For his nephew’s baptism, Dane Schmitt double splined and glued a cross of jatoba and cherry then finished with paste wax. He also added his nephew’s initials to the cross. This series of photos shows David's progress. 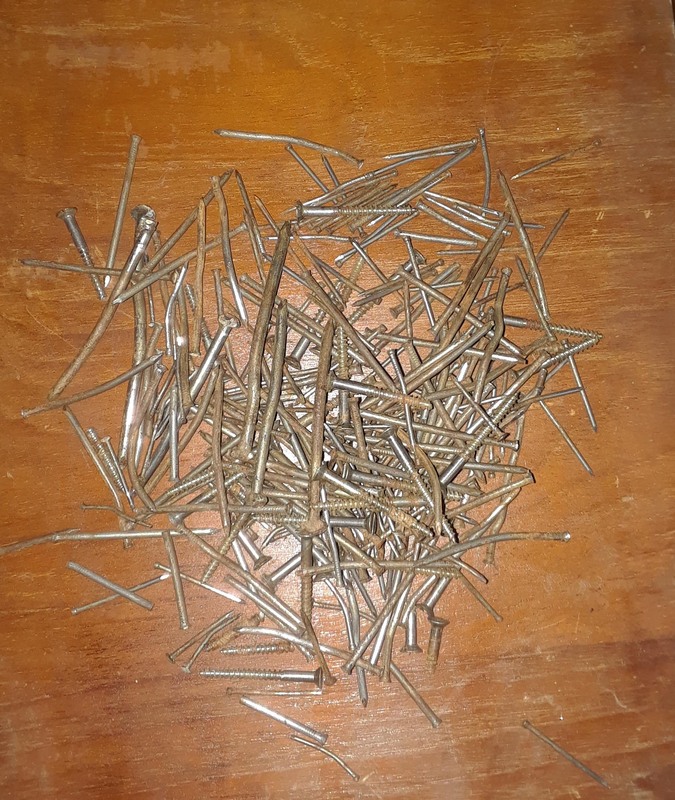 The second photo from the left show the large quantity of nails and screws pulled out of the entertainment center. 2Toy of the Month was started by Toy Program Coordinator, John Lastrapes, to encourage participation.